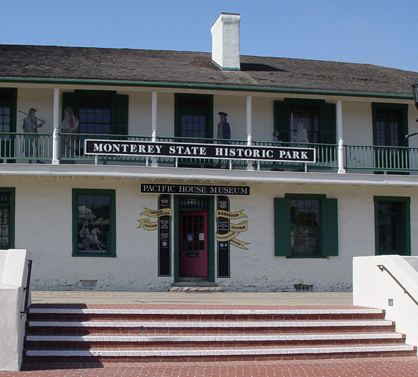 Monterey State Historic Park consists of over 10 historic structures and places within a half mile of the Custom House Plaza, in downtown Monterey, near Fisherman’s Wharf. From San Francisco, Sacramento and points north: take the Pacific Grove/Del Monte Avenue exit off of southbound Highway 1. There are two other Del Monte exits prior to this one that are incorrect. Follow Del Monte for approximately one and a half miles. Turn right into the Fisherman's Wharf and the Historic Park parking lot. From Carmel and points south: take the Munras Street exit off of northbound Highway 1. Continue south on Munras which eventually becomes Abrego Street. Continue on Abrego which eventually becomes Washington Street. Follow Washington Street until it ends at the Fisherman’s Wharf parking lot. From Los Angeles and points east: take Highway 68 westbound from Salinas to Highway 1. Merge into the left lane to head toward Monterey. Take the Fremont Street exit and proceed to the third signal. Turn right onto Abrego Street which shortly becomes Washington Street. Follow Washington Street to the Fisherman’s Wharf parking lot. Monterey State Historic Park is a collection of significant historic houses and buildings interspersed throughout Old Monterey. The inside of many historic adobes can ONLY be viewed with a State Park Guide. 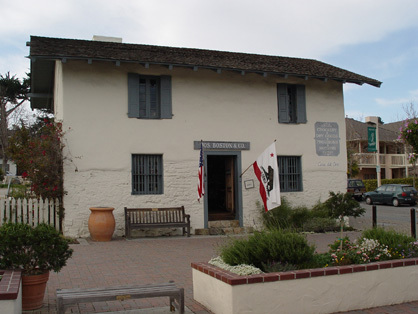 Tour information and tour tickets may be obtained at Pacific House Museum – a great way to start your discovery of Monterey. Step into the past on the “Monterey Walking Path of History” and view the site where Spanish explorers first landed in Monterey in 1602. See one of the nation’s last remaining whalebone sidewalks. Walk the same streets that famed author Robert Louis Stevenson walked in 1879. Explore this two-mile path and discover some of California’s most historic homes, buildings and beautiful gardens along the way. Monterey served as California's capital under Spanish, Mexican and U.S. military rule. The U.S. flag was first officially raised in California here on July 7, 1846, bringing 600,000 square miles of land to the United States. Monterey’s Path of History can be entered at any point. Just follow the yellow-tiled markers and discover Monterey State Historic Park, an area that preserves and interprets places and objects of statewide historic significance. 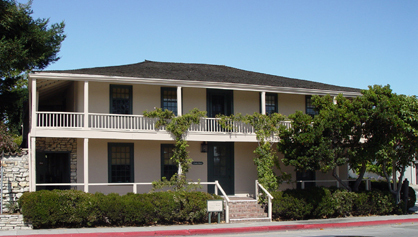 Twelve buildings, including the Custom House, the oldest government building in California, and several residences (now house museums with guided tours), are all part of Monterey’s 55 Path of History sites. For more information call the Pacific House Museum at (831) 649-2907, located at 20 Custom House Plaza. 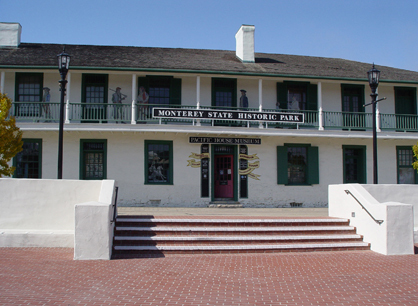 Please visit our non-profit Community Support Group, Monterey State Historic Park Association . Your membership helps keep adobes open and educational programs going throughout the park. 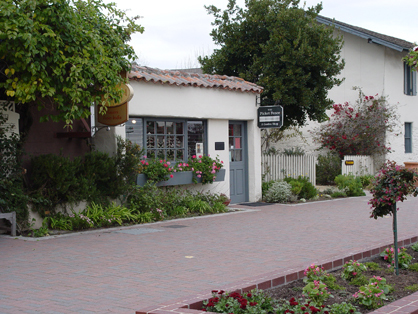 The park main office is located at 20 Custom House Plaza in historic downtown Monterey. From San Francisco, San Jose, Gilroy, Marina and other cities from the north, take the Pacific Grove/Del Monte Avenue exit off of Highway 1. There are two other Del Monte exits prior to this one that are incorrect. Follow Del Monte for approximately one and a half miles. Turn right into the Fisherman's Wharf, Historic Park parking lot. If you end up going through the tunnel, continue on until you can legally turn around. Then return to this parking lot turning left this time. Watch for the signs. From Big Sur and Carmel, take the Munras Street exit off of Highway 1. Continue down Munras which eventually becomes Abrego Street. Continue on Abrego which eventually becomes Washington Street. Follow Washington Street until it ends at the Fisherman's Wharf parking lot. This entire journey is less than two miles in length. From Los Angeles, San Luis Obispo, Salinas, Fresno, Sacramento, Los Banos, Hollister and other cities from the east, take Highway 68 to Highway 1. At this major intersection move into the left lane as this will take you toward Monterey. (Right-hand lane goes to Seaside or Santa Cruz.) Take the Fremont Street exit and follow to the third signal. Turn right onto Abrego Street which shortly becomes Washington Street. Follow Washington Street until it ends in the Fisherman's Wharf parking lot. This entire journey is less than two miles in length. For Weddings and Special Events, call 831-649-7118. The historic gardens are open to the public at no charge, and do not require reservations. 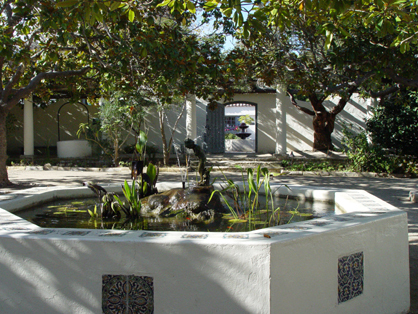 Monterey State Historic Park gardens are our “best kept secret” and include: the Memory Garden at the back of Pacific House Museum at Custom House Plaza; Casa Soberanes garden at the corner of Pacific Street and Del Monte Avenue; Stevenson House garden at 530 Houston Street; and Larkin House garden between Calle Principal and Pacific at Jefferson Street. Please visit the Secret Gardens link on the left hand column for detailed information about the State Park gardens.